The Service to Sport Awards is a flagship event in the Herts Sports Partnership calendar. It represents an opportunity to bring together the dedicated, enthusiastic and life-changing individuals, projects and clubs that make up the sport and physical activity landscape of our county. On the 27th November 2018, over 500 guests celebrated the great work and unwavering commitment volunteers bring to the leisure sector, the innovative ways of keeping our residents active and the life long service many of the workforce has made. This award recognises those individuals who are integral to a smooth operation, but are very often unseen and unheard. Usually a willing parent, we’re looking to celebrate for the kit washers, tea makers, minibus drivers, line markers, fixture organisers and the like! This award recognises the outstanding contribution of a female coach at community level who provides high quality coaching in a voluntary capacity. This award recognises the outstanding contribution of a coach working in disability sport at community level who provides high quality coaching in a voluntary capacity. This award recognises the outstanding contribution of a club or group providing disability sport opportunities at community level over the last 12 months. 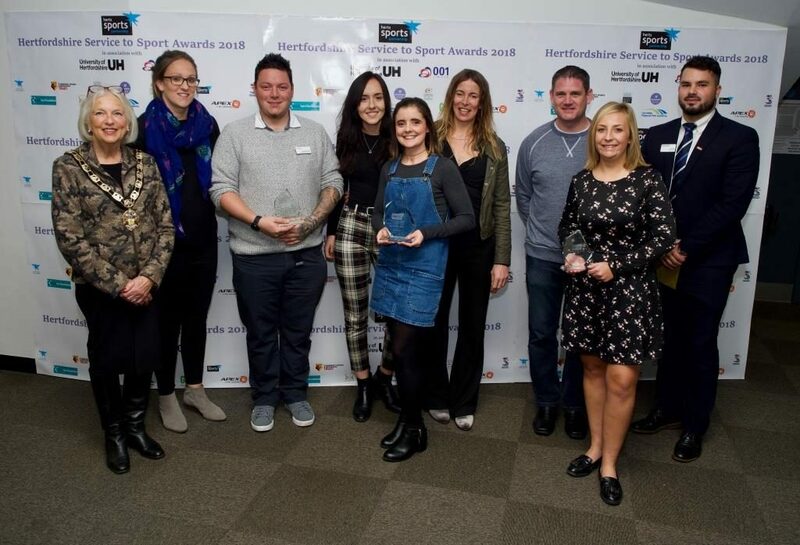 This award recognises the outstanding contribution of a sport or physical activity volunteer at the University of Hertfordshire. This could be as an activator, a coach, or someone behind the scenes who helps keep everything together. This award recognises clubs, and sections within community clubs whether old or new, who can demonstrate why they are outstanding and make a notable contribution to their local community over the last 12 months. This award recognises the outstanding contribution of an individual or group who have taken a leading role motivating and inspiring women through sport and physical activity over the last 12 months. The award is all about celebrating those individuals or groups who help women get active no matter how good they are, how fit they are or how they look. This award recognises a community project that has delivered high quality sport or physical activity and demonstrated significant commitment to increasing participation during over the past 12 months. This award recognises outstanding commitment to sport over the last 12 months. Selected by an independent panel, this award recognises those individuals or groups who have shown the most proactive effort to increase physical activity across their projects, engaged with the spirit and message, and evolved their existing opportunities as a consequence of the HertsYOPA18 campaign. Selected and judged independently by our partners at Sporting Futures Training, this award celebrates the outstanding development, impact and contribution of both a Male and Female Sports Apprentice over the last 12 months. Selected and judged independently by our partners from the local parkrun community, this award celebrates the outstanding dedication, commitment and voluntary service from a parkrun volunteer across the last 12 months.